Is Pakistan playing with the world? 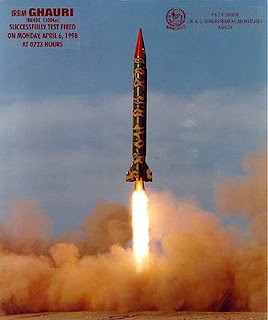 Pakistan tested its nuclear bomb in 1998 in a response to India’s nuclear test in 1974. Since then it has never stopped increasing its nuclear arsenal, now the number of it’s nuclear warhead reaching an alarming level, surpassing India, and it has become a hot topic in the world politics. Adm. Mike Mullen, the chairman of the Joint Chief of Staffs, confirmed the assessment of the expanded arsenal. (Source: The New york Times). Pakistan is not yet a signatory of NPT and it is also not a signatory of “no first use policy” [of nuclear weapons] with other countries. To give a hard response to India, Pakistan acquired nuclear and missile technology from China and it is been accused of giving this technology illegally to North Korea, Libya and Iran, which is a matter of worry for America and the world. (Source: Time Magazine, The Man Who Sold the Bomb). Pakistan has been developing nuclear ams rapidly. Interestingly, it is developing when the world fears that Pakistan’s nuclear arms may fall into Talibanese hands. India, on the other hand, is a little disturbed with these developments as Pakistani nukes aims in India and are ready to fire. The question is, Pakistan is the country which doesnt have military equipments, money and infrastructure to fight Taliban, save civilinas in the war, give them education and basic needs, how is it producing nuclear arms? Every month US, UK and some other countries each gives billions of dollars to Pakistan as aid to fight against terrorsim, to develop infrastructure and education. The money which Pakistan receives monthly is comparable to the money generated by other developing countries of the world. But Pakistan is using this money against India. As soon as America increased the amount of monthly aid to Pakistan we have seen the development of Pakistani military against India (Source: Is Pakistan using US aid to expand nuclear arsenal?) & (Source: Pak Using US Aid for War Against India). The final Question: Is Pakistan really serious about destroy Taliban or still dreaming of destroying India after loosing four wars against it? You may like: Pakistan and Taliban, Brothers or Rivals?